Chevy Chase Town Hall is located at 4301 Willow Lane, Chevy Chase, MD 28015; phone: 301-654-7144. Photo: The Wiley-Ringland House, ca. 1893, 4722 Dorset Avenue, Chevy Chase, MD. Virtually destroyed by fire in 1978, the house was restored in 2002. Listed on the National Register of Historic Places in 2000. Photographed by User:Farragutful (own work), 2011, [cc0-by-1.0 (creativecommons.org/publicdomain/zero/1.0/deed.en], via Wikimedia Commons, accessed February, 2014. Bordering Washington, D.C., the incorporated limits of the town are home to just over 1,000 homes and 3,000 residents. Francis G. Newlands and William M. Stewart formed the Chevy Chase Land Company and purchased thousands of acres in the 1890s. They built an electric railway, installed water and sewer systems and built roads. It is named for a 1725 land patent named "Cheivy Chace" purchased from Lord Baltimore. Development of the town began in earnest after World War I, spurred on by the growth of automobile traffic. The municipality was incorporated in 1918. The town grew over the years through a series of annexations. 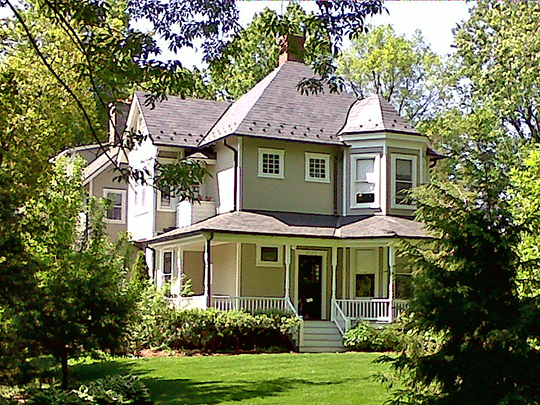 Town of Chevy Chase, History, www.townofchevychase.org, accessed February, 2014.